It's often desirable to have a comprehensive list of all the hardware and software installed on your machine. Belarc Advisor is the way to get it. 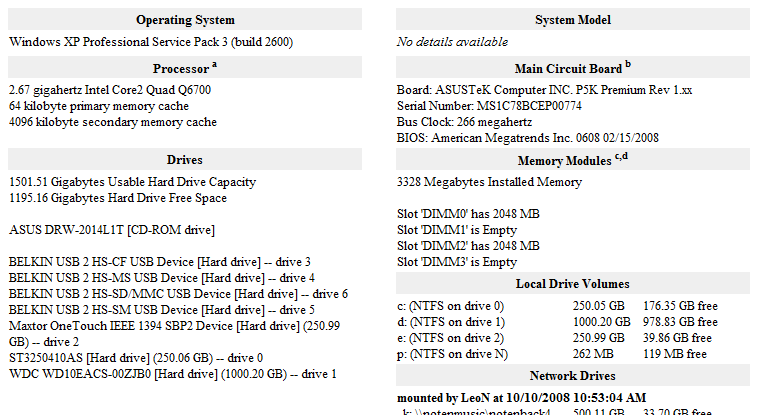 Is there a way or a tool to tell me what the computer's specs are? There are various tools, including Windows itself, that will report on various aspects of your computers configuration. Most focus on one or two specific aspects, though, and make it difficult to form a picture of your computer as a whole. Belarc Advisor is a PC auditing program that examines your computer and produces a one-page report of all the hardware and software installed on it. The report goes on to include all Users, Printers, Displays, Network adapters and other hardware, as well as listing all installed software, licenses (including product keys) and hotfixes. Belarc Advisor is free for personal use, and a great utility for auditing and recording your comprehensive system state. How do I find out what's installed on my machine? Programs can be installed in many ways and many places. There's no single authoritative list of what's installed, but we can get close. Shovelware: What do I do with all this extra software on my new machine? Shovelware - lots of extra software you didn't ask for - appears on almost every new machine these days. I look at why shovelware exists, and what you might want to do about it. I've used this utility for years now - I LOVE IT! Aida32 is another VERY comprehensive professional system information, diagnostics and benchmarking program running on Win32 platforms. It extracts details of all components of the PC. It can display information on the screen, print it, or save it to file in various formats like HTML, CSV or XML. It's gotta be one of the top 5 most useful utilities ever. Oh, and it's free. I LOVE Belarc Advisor!!! I have installed it on all of my PCs and those that I have repaired for family and friends. I inform all who use this wonderful FREE program, to print out the complete information for future reference. Plus, by printing out the information, the print out will give me all of the Product Key Codes numbers/letters, should I have to re-format and re-install Windows. Saves me LOTS of time and energy. No, it is not as thorough as other programs, but most of those are not FREE and most times, all you need is the basic information. Another great feature of Belarc Advisor is that it tells you whether or not your PC security updates from Microsoft is up to date. That in itself is a great assess, especially when I am trying to 'trouble shoot' someone else's PC. I started using BA way back and I think it's a nice app to have. But I wish there was simple information on how to correct benchmark failures. Those little red x marks bother me. Belarc is good. I like the fact that it even includes updates that aren't installed. I really don't know of another that does that. People that think their machines are completely up to date will probably be surprised. I also use SIW because it's portable and Belarc has to be installed. You could carry around the Belarc.exe on a stick also. Don't see a downside there either. Belarc Advisor produces a comprehensive Specification Report (mine runs 10 pages) of my computer and it's FREE for personal use. The information is invaluable when you need Technical Support and you are asked for spec. data. I highly recommended this software program. I highly recommend Belarc Advisor, however, I have found that the Windows Serial keys and Microsoft Office keys they shown seem to never be the correct ones. All other data seems to be 100% correct and Belarc is an invaluable software program, my guess that Microsoft is somehow affecting what 'keys' can be read. I've used this on at least 20 PC's over the years and the inaccuracy of the MS keys have been the only flaw.